On January 11 at the Motobu Children's Hall in Haebaru, junior high school and high school students danced "Haberu moui." On January 11 at the Motobu District of Haebaru Town, a traditional performance of “Haberu moui” was performed at a New Year’s party held at the Children’s Hall for the first time in 64 years since 1950. Many people visited the hall to see the revival of the traditional performance. Residents applauded and cheered the junior high school and high school students who performed the dance. Haberu moui is a courtship dance in which two women perform as flowers and two men play the part of butterflies. After finding pictures of the 1950 dance contest two years ago, residents of the district have prepared to revive the dance. Senior residents who performed in 1950 taught the students the dance. 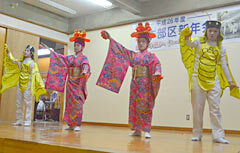 Two male students performed the butterfly dance last September.